Lazy Seamstress: I don't really do black. As a teenager I wore a lot of black, I used to have long conversations with my Dad about how black came in so many shades that I didn't need any other colours in my wardrobe! Back then I owned one red dress and every time I wore it my Dad would tell me how much nicer I looked not wearing black. Those teenage days are long gone and now I find that other than t shirts and cardigans my wardrobe contains almost no black. So, a few weeks ago when I checked my email late at night to find a message from Sam, at Ministry of Craft saying I should wear all black for the Vintage By The Sea event the next morning , I had a mild panic, but compromised with a grey circle skirt, black t shirt and cardigan. Sam later said she knew I wouldn't own any black! Today I was again working with Ministry of Craft at a Macmillan event in Stockport, again the dress code was all black, so I ran up this skirt especially. 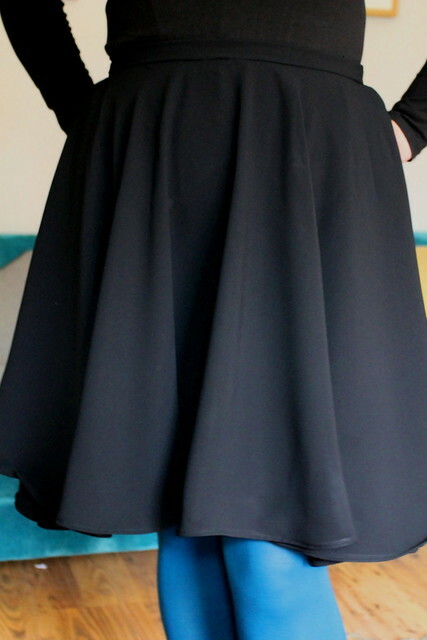 I was intrigued by a post I'd recently read over at Petit Main Sauvage about a part circle skirt given more fullness by adding in panels that pleated into the width of the skirt. Using that idea I tried something similar using the same polyester crepe I'd used on my librarian dress. The result is a very full skirt, with a fabulous swishy drape. I will almost certainly try something like this again, it's a fun way to make a quick skirt that is equally fun to wear. Love the skirt, but especially with the pop of blue in the tights. I went to the festival, what a shame we didn't bump into each other, it was busy though! Oh Mags, I wish I'd known you were there! I was only there on the Saturday teaching at the Ministry of Craft workshops. Would have been lovely to have met you. Love it. Coloured tights are so cute!